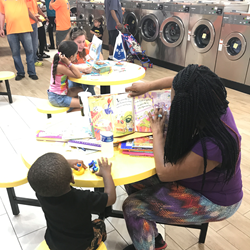 The Laundry Cafe, The LaundryCares Foundation, and Partners Offer Free Laundry and Children's Literacy Resources in Philly. Every child was able to go home with at least two books of their choice and beautiful writing kits developed by our friends at Teaching Beyond the Square! On the afternoon of July 19, 2018, the owners of The Laundry Café at 400 W. Allegheny Ave., Philadelphia, PA – Brian Holland, Tyrone Akins, and Ray Chamberlain – hosted a LaundryCares Foundation Free laundry Day for more than five hours, helping hundreds of people in need within the community to wash their clothes, grab a bite to eat, be entertained, and enjoy books and learning activities for kids. This flagship event for LaundryCares involved The Laundry Cafe staff, a group of over 70 volunteers from across the country, donations and sponsorship from various manufacturers, and members of the Coin Laundry Association Board of Directors and staff. Together, more than 16,000 pounds of laundry were washed and dried, keeping the machines of The Laundry Café busy non-stop for the entire duration. In addition to providing laundry services, LaundryCares – in partnership with organizations such as Too Small to Fail, Libraries Without Borders, Read by 4th, Fab Youth Philly, and Encore.org – kept children and families engaged at the laundromat with talking, reading books, singing songs, making art, and playing games. According to Jane Park Woo of Too Small to Fail, “Every child was able to go home with at least two books of their choice and beautiful writing kits developed by our friends at Teaching Beyond the Square!” Furthermore, children’s author, motivational speaker, and storyteller Nahjee Grant interacted with the kids and signed copies of his books, including the popular title Aron Goes to the White House Science Fair. Additionally, food, beverages, and shelter from the oppressive heat were offered to all who participated. Local law enforcement officials provided security and engaged with patrons.